Commissioner Deb Conklin asks the three ombudsman candidates questions during a public interview in Sept.
UPDATE: Tonight's OPO Commission meeting has been canceled because notice of the special session was not posted at least 24 hours prior, as required by law. The commission was set to make a hiring decision this evening. 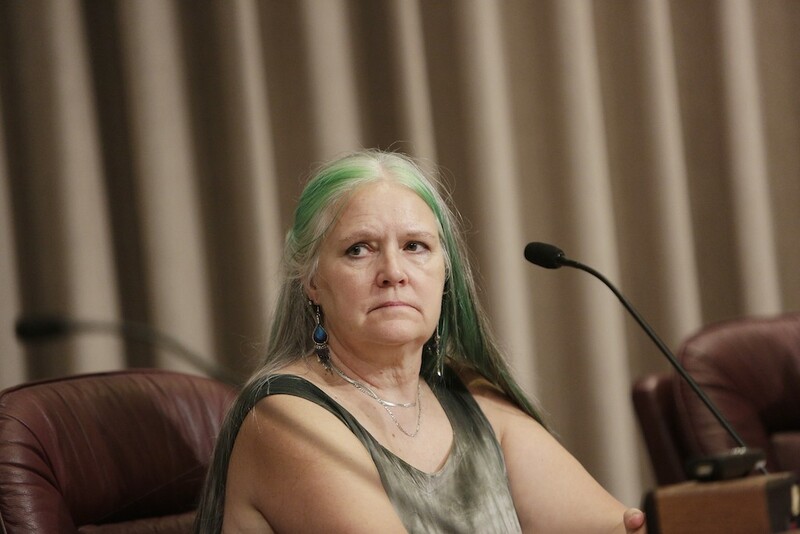 Commission chair Deb Conklin says the commission submitted an agenda and notice of the meeting to the City Clerk's Office Monday, but the clerk never posted it. Each of the three candidates for Spokane's police ombudsman come with baggage that has raised serious concerns. Critics point to the selection process and more specifically the selection committee as the source of those concerns. The committee members are Spokane Police Capt. Brad Arleth, who represents the lieutenants and captains' union; John Griffin, who represents the police union; City Attorney Nancy Isserlis; and Jan Dobbs, the CEO of Frontier Behavior Health, who helps train police officers. It turns out, the process was much different the first time the city hired an ombudsman. George Critchlow, a Gonzaga University law professor, was one member of the board responsible for vetting possible candidates back in 2009. He says board members traveled throughout the country to meet the top picks and check their references. Critchlow went to California to meet with Tim Burns, who was eventually hired. He says he spent two days in Visalia, California, speaking with Burns and investigating his reputation. "It was basically a background check to determine his reputation, his competency, his relationship with people, his style of problem-solving and his propensity to be fair and do the job we were interested in hiring him for," Critchlow says. That meant contacting references Burns provided, but also included cold calls to people he didn't offer up. This time around, the selection committee only contacted references provided by applicants and didn't make any investigative trips. "The selection committee tried to balance the desire to be thorough with quickness and efficiency," Coddington says. "The expectation was that the ombudsman commission would do its own due diligence." Not long after the selection committee sent three names to the OPO Commission did concerns about the candidates' baggage surface, asking the question: Did anyone even Google these guys? Allen Huggins has been critical of the Black Lives Matter movement and protests in Baltimore in comments on the Wall Street Journal website. Speakers at a community forum last week said those comments should disqualify him from the job. Robert Breeden retired from his previous position as assistant special agent in charge of the Florida Department of Law Enforcement in Miami after an investigation found he violated policies and created a hostile work environment. Breeden also filed a whistleblower lawsuit against FDLE in May that's still pending. Raheel Humayun is currently an investigator for British Columbia's Office of the Ombudsperson and would require a work visa, which could take months — a logistic that could thwart his chances of getting the job despite his qualifications. Of the three, Humayun is the only one who has not been a cop. Coddington says the selection committee did an online search, but he is not aware of the results. He notes that Breeden self-disclosed the lawsuit and circumstances of his departure in Florida. "What I find concerning is we're talking about hiring an ombudsperson, someone whose job it is to bring transparency, make recommendations on policies and procedures," says Deb Conklin, acting chair of the OPO Commission. "This job is all about public trust and transparency with the public. Up until the referral of those three names it was all done totally in private. There's a deep irony in that." She's referring to the fact that the five-member selection committee met in executive session, rather than open public meetings, when discussing candidates' qualifications. The Open Public Meetings Act allows closed meetings for discussions about job applicants for public positions, but there is nothing in the law that says those meetings must be closed to the public. Coddington says the executive sessions were intended to protect the 41 applicants, most of whom had other jobs while they were applying. However, after the selection committee announced in May that they'd whittled the pool down to 13, they continued to meet in private. "Given the discussions that were happening during the interview process, the committee took the actions they felt were necessary," Coddington says, adding, "They followed a process they felt was going to balance being thorough with being quick and efficient to select the best three candidates." Conklin says the selection process has been totally inadequate and points to one applicant she believes the search committee overlooked. Andrea Brenneke is a Seattle attorney with a lot of experience in mitigating community and police relationships, yet she didn't make the list of 13. One example of her expertise on the issue is her work implementing a restorative justice circle after a Seattle Police officer fatally shot a First Nations woodcarver. The conflict resolution method is designed to address issues that can fall through the cracks of the criminal justice system — such as relationships between police and minority communities. "It's more of a healing approach," Brenneke told the Inlander in June. "People are using restorative practices to engage conflict in a different way that doesn't look at what was done wrong and who is to blame, but is best served by coming together in a dialogue where we explore the impact and harms and what are the interests and needs of people in that group." She adds that restorative justice is not always the answer. Some issues need to be worked out in court. "I find it unacceptable that after seven months, we end up with these three candidates with serious unanswered questions and someone who looks like a very attractive candidate doesn't even make it to live interviews with the search committee," Conklin says. "Someone needs to explain how we got here." Nancy Isserlis, the chair of the selection committee, has not responded to multiple phone calls and emails. We'll update this post when she gets back to us. Tonight, the OPO Commission will meet at 5:30 in the City Council chambers to make a decision. They will either hire one of the three or tell the selection committee to give them three new names. "At this point, I honestly can't tell you what the decision will be," Conklin says.